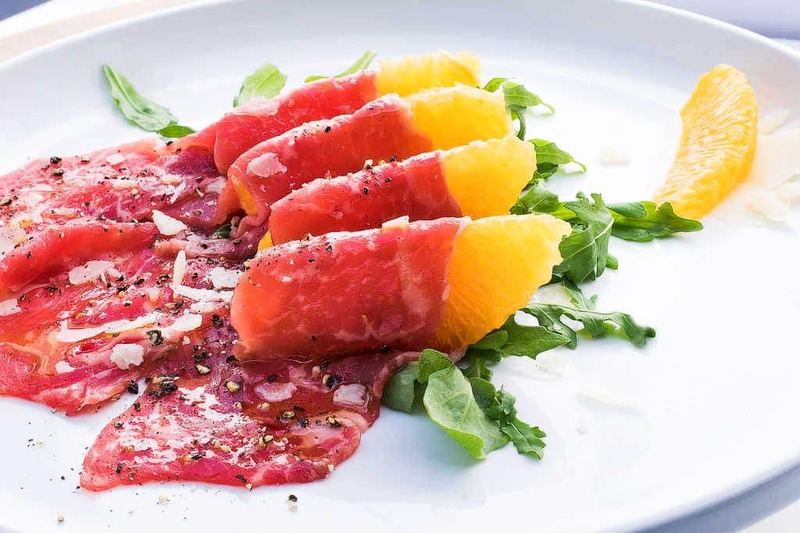 One of the most famous Italian antipasti, beef carpaccio was invented in the 1950s by Giuseppe Cipriani at Harry’s Bar in Venice. As the story goes, he created the dish for a countess who was on a strict diet that included raw meat. He named it after 15th-century Venetian painter Vittore Carpaccio, because the contrasting colors of this new dish reminded him of Carpaccio’s work. 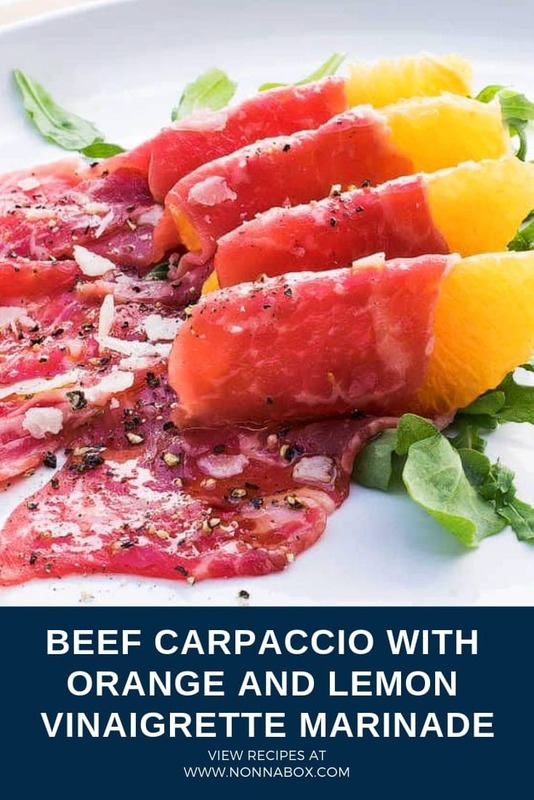 The traditional recipe is made with the freshest beef sirloin and served with just a squeeze of lemon, some black pepper, and shaved Parmigiano-Reggiano cheese as an appetizer course. 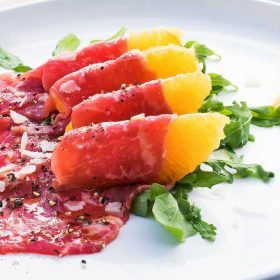 This beef carpaccio recipe is simple and delicious with orange and vinaigrette. Trim off the very top and bottom of the oranges with a sharp knife. Set the fruit on end and cut the skin from its flesh, beginning at the top and following the curves. Cut out each section of the fruit by inserting the blade of the knife between the flesh and the membrane on each side. The wedges should come out easily, leaving the membrane intact. Transfer to a dry plate, discard excesses juice, cover, and refrigerate for 30 minutes. In a medium bowl, combine the lemon and orange juices, olive oil, salt, and pepper and whisk together. Place the arugula on a serving plate. Dip each slice of meat in the vinaigrette and then wrap it around an orange segment, leaving some of the meat flat on the plate. Repeat this step until you fill the large serving plate. Drizzle the rest of the vinaigrette over the meat and orange segments. Top with shaved or crumbled Parmigiano-Reggiano, freshly ground black pepper, and sea salt flakes to taste.